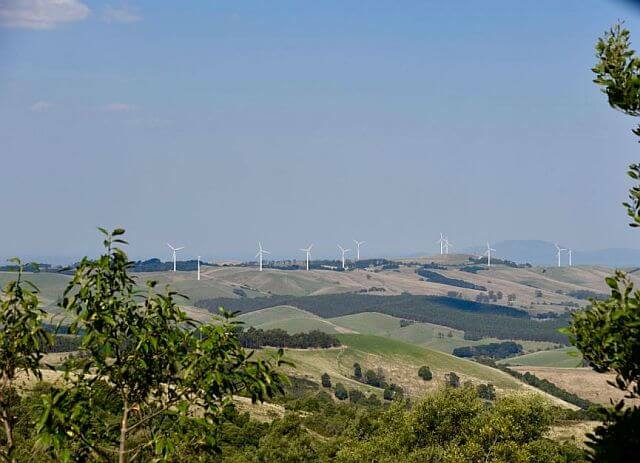 Precisely 197 km from Melbourne on the South Gippsland Hwy lays the town of Toora. 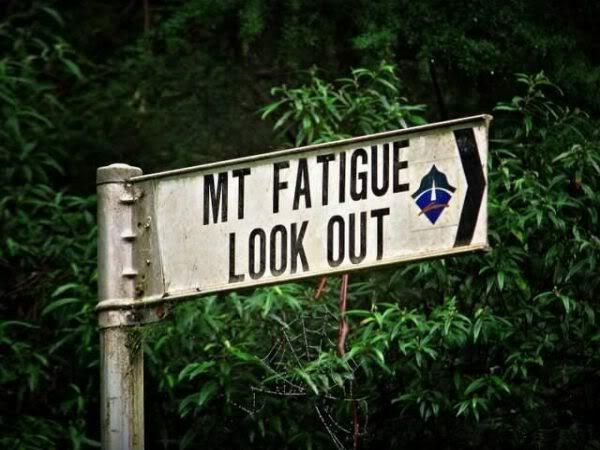 From here, after further 18 km of the winding road, it is possible to reach the peak of Mt Fatigue. The views from there are typical for this region. 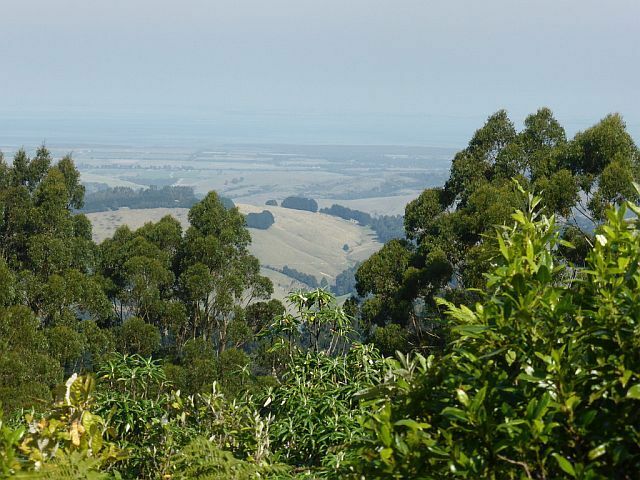 To the North and East, as far as eye can see, spread the Strzelecki Ranges, the hills covered with forests, with primordial jungle still intact in some places. To the South a view spreads out to the very beautiful Wilsons Promontory National Park. 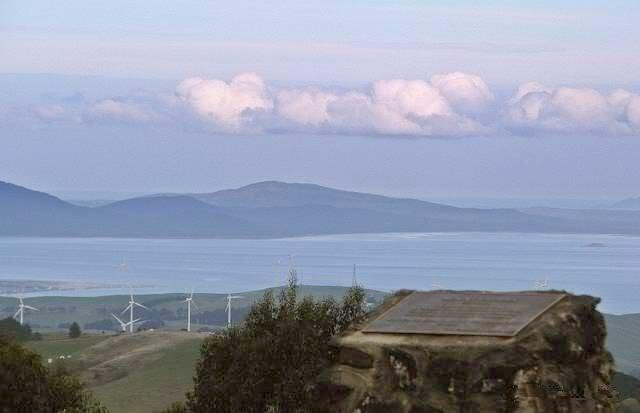 In good weather conditions the Philip Island can be seen to the East _see above_. „Toora” in language of indigenous people means: „woman, look after fire”. Before a Caucasian arriving at bonfires women and children of the Kurnai tribe used to stay in this place at bonfires, while the men used to walk away to the neighboring peninsula, called the Wilsons Promontory, to perform their religious ceremonies. At the end of the 19th century, the biggest in Victoria tin mines were close to the Mount Fatigue. In the process of rinsing mineral out with waters of the streams Agnes and Dingo Creek, some huge excavations, at present covered with the flora, were left on the hillsides. In the next years, coal turned out to be a greater treasure, as pointed out early by Strzelecki. Gold was dogged also on the slopes of Mt Fatigue, after being discovered by William Turton. He arrived with the young wife in Victoria in 1856 in years 60 and 70 of the last century worked as a surveyor in Gippsland, on the vast area area up to of the border of New South Wales. In those days the geodesist moved on with his supplies camp from hill to the hill, carrying measurements and entering the data on a map. 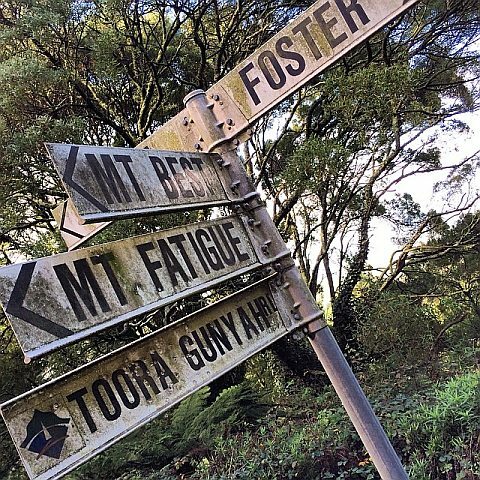 Turton began his work from Mt Fatigue. He set his camp in the distance of two miles from the top, on which he intended to build a station to carry out measurements and observations from it. A solid road was built between the camp and the top. Turton, freshly arrived in the gold fever time, dreamt of finding a gold mine. Himself he carried out his professional duties, however he „delegated” two people to search for the named metal. Supplied with his directives, they discovered gold in the nearby stream which they named Turton's Creek. The stream had to be affluent because at the end of the 19th century this precious metal was still being extracted there. And today it is also worthwhile trying ones luck and going with the frypan to the stream. 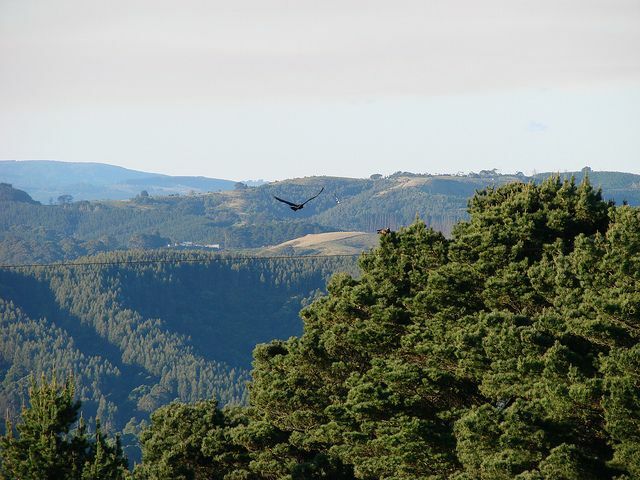 After a short stay on Mt Fatigue, Turton with all his camp moved to the neighbouring hill carrying out his observation. Perhaps the reason was also a fact that a forest fire in 1863 destroyed the „Turton's road”, and the winter flood wiped out the bridges constructed. The falling trees completed the act. Today it is easy to reach to the Mt Fatigue by car. Many tourists visit this place because of the fabulous views. 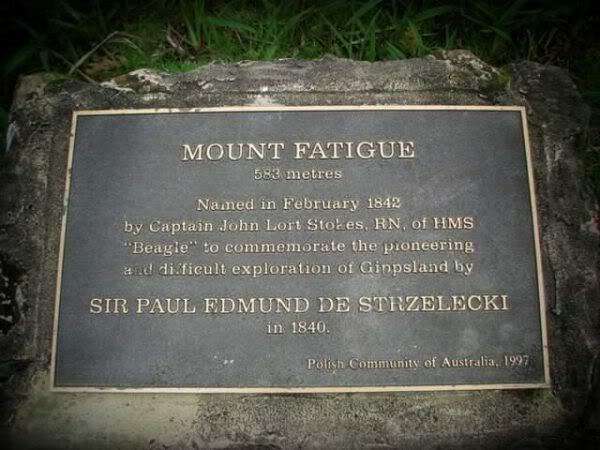 However there is no inscription here informing that the hill has been named in honour of the Polish researcher, Sir Paul Edmund Strzelecki. Over 11 years ago Lech Paszkowski in the article Sobieski Street and Mount Fatigue (Polish Weekly, 13.04.1985) wrote about commemorative plaques which should be funded by Poles. „In the nicely established miniature museum in Tidal River there is no mention anywhere that Paul Strzelecki was the first scholar who examined the Wilsons Promontory and Sealers Cove in January 1842. 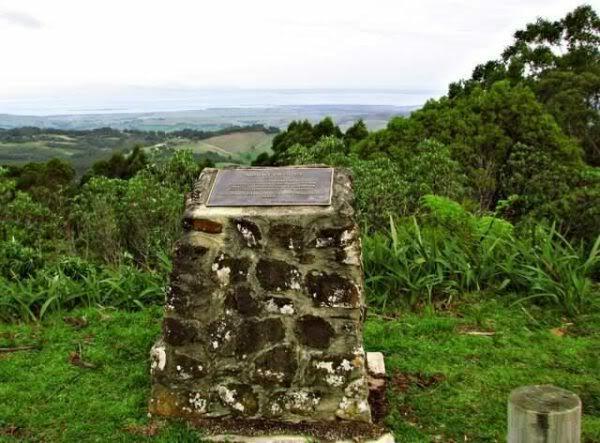 Perhaps at one time the Poles will remind about it to Australians by funding the boards at Sealers Cove, mounted on some rock or the obelisk? Such a board would be useful also on the Mount Fatigue, as probably nobody today remembers origins of this name. Will we fund them in the year of the Polish researcher’s jubilee? 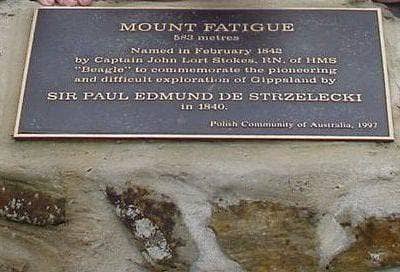 In 1997, on the 200 anniversary of P. E. Strzelecki’s birth, the Polish Community in the State of Victoria funded and installed a commemorative plaque on the Mt Fatigue. _ See _ cos2 cos3 cos4 cos5 cos6 cos7 cos2 other photos from the Mount Fatigue. The above article appeared in the „Polish Weekly” in Melbourne 07.12.1996. * Click to _ expand _ excerpt „Voyage of H. M.S. Beagle” by J. Lort Stokes. Click _to collapse _ this information. „The party was now in a most deplorable condition. Messrs. MacArthur and Riley and their attendants had become no exhausted as to be unable to cope with the difficulties which beset their progress. The Count, being more inured to the fatigues and privations attendant upon a pedestrian journey through the wilds of our inhospitable interior, alone retained possession of his strength, and although burdened with a load of instruments and papers of forty-five pounds weight, continued to pioneer his exhausted companions day after day through an almost in pervious tea-tree scrub, closely interwoven with climbing grasses, vines, willows, fern and reeds. Here the Count was to be seen breaking a passage with his hands and knees through the centre of the scrub; there throwing himself at full length among the dense underwood, and thus opening by the weight of his body a pathway for his companions in distress. Thus the party inch by inch forced their way; the incessant rains preventing them from taking rest by night or day. Their provisions, during the last eighteen days of their journey, consisted of a very scanty supply of the flesh of the native bear or monkey, but for which, the only game the country afforded, the travellers must have perished from utter starvation.